"Slight Rebellion Off Madison" -- The first story J.D. Salinger ever published in The New Yorker was also a story that introduced readers to his most famous character, Holden Caulfield, long before the publication of The Catcher in the Rye. According to Paul Alexander's biography of Salinger, the editors of The New Yorker accepted "Slight Rebellion Off Madison" back in 1941, but delayed publishing it when the US entered World War II. The time just didn't feel right for a story about jaded, cynical youth. Eventually the war ended and the story appeared in the magazine on December 21, 1946. The Catcher in the Rye came out five years later, in July, 1951. In the story, Holden Caulfield, "on vacation from Pencey Preparatory School for Boys," meets up in New York City with Sally Hayes, also on vacation from prep school, and together they go to the movies, smoke in the lobby, drink, complain about the tedium of school, dream of leaving the big city for Vermont, and maybe getting married one day. Other characters who later appear in Salinger's generation-defining novel -- for example, Carl Luce -- also make appearances too. You can read "Slight Rebellion Off Madison" in the New Yorker archive. 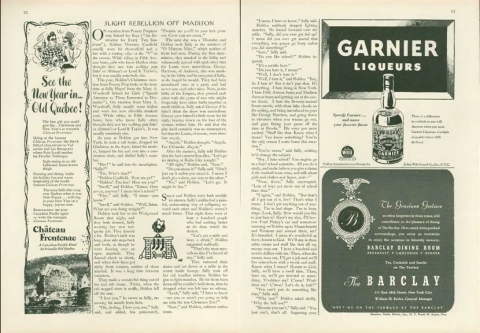 Click here to see a facsimile of how the story originally appeared in the magazine. When you click through, please click on the image/page to zoom into the text. Note: Another story story featuring Holden Caulfield -- "I'm Crazy" -- appeared in the December, 22 1945 edition of Collier's. It starts here and ends here.